Welcome to the second game of the Final Four of my investing strategies tournament. 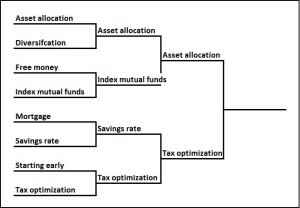 Here we have Savings rate taking on Tax optimization. In the first round, Savings rate beat Mortgage just on the sheer power that saving more money can have on the ultimate size of your nestegg. Tax optimization squeaked by Starting early due to the enormous value created with minimal sacrifice by setting up the accounts to minimize your taxes. As always, give the disclaimer a peek. With that out of the way, let’s see who wins. Savings rate is a simple but overwhelming force, maybe like Patrick Ewing when he dominated the Final Fours during his years at Georgetown (I don’t mean to call Ewing’s game simple, but you’ll see what I mean). 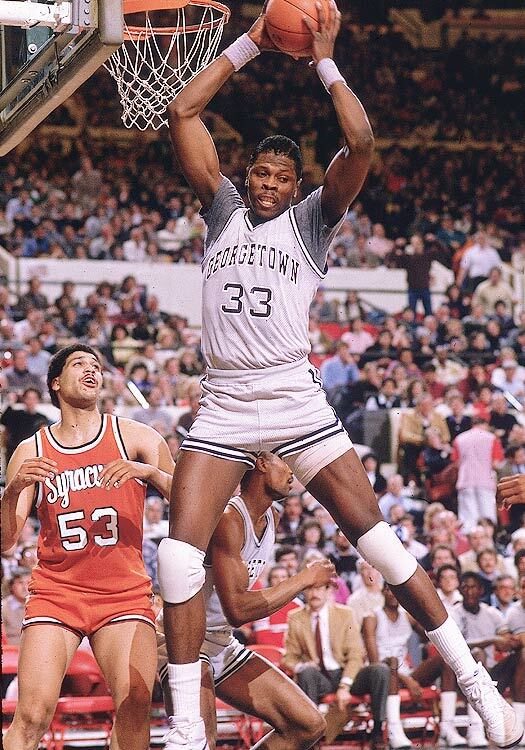 Ewing just owned the basket—any shot you put up he blocked, if you did get the shot up he got the rebound, when he got the ball you weren’t stopping him. It all revolved around Ewing, and his dominance on the inside covered up for his shortcomings (outside shot, passing) as well as those of his teammates. In the investing world, the sun really rises and sets with Savings rate. Without any savings, you can’t invest so it really doesn’t matter what you do with things like Index mutual funds, Asset allocation, or Free money. Also, unlike any other investing strategy, Savings rate can make up for any other mistakes you make along the way. It’s a lot like Ewing protecting the rim on defense; if your guy beat you, you could be pretty confident that Ewing would bail you out by blocking his shot. You could completely screw up Asset allocation and stuff all your money in a mattress—just crank up your Savings rate and there’s no problem. Don’t participate in your 401k and walk away from the Free Money—save a little more and you’re okay. You get my point. Let’s use the same example of Mr Grizzly starting out at age 22, making $50,000 which will eventually rise to $100,000, and who wants to be a millionaire by the time he’s 60. Let’s say he does everything right, plus he has a horseshoe growing out of his rear end, and over his investing career he averages a 10% return; he would only need to save about 3% of his income. That’s probably a breeze. Now, instead he has an average investing track record with returns of about 6%, he would need to save about 9% of his income. So Savings rate was able to make up for his lack for tremendous luck. Keep going down that path and let’s say he put all is portfolio in a local bank earning 1% interest, which I think we would all agree is a pretty terrible investing strategy, and he still becomes a millionaire so long as he saves about 24%. So you can see that Savings rate can make up for all manner of investing sin. Pretty much any other investing strategy has its limits to how far it can take you before you exhaust its benefits. But of course there are no free lunches. Increasing your Savings rate comes at a much higher cost than other investing strategies, namely all that money you’re saving means you can’t spend it on other things. So when Mr Grizzly needs to crank up his Savings rate, that money has to come from somewhere—he passes up on that salmon fishing trip, or buying Mrs Grizzly some artisan honey from the farmer’s market, or getting some detangling shampoo for his coat. We can debate whether those purchases are worth the money, but to Mr Grizzly they are (cut to Lady Fox nodding and pulling out a Pottery Barn catalog). Sure, you can start by cutting away the layer of winter fat, but the higher you make your Savings rate the more you start cutting into muscle and eventually into bone. That, my friends, is the rub with Savings rate. Taxes are to investing what water damage is to a house—unwelcome, can really ruin stuff if not attended to, and it gets into everything. The tentacles of taxes traverse tremendous territory to touch your total transactions (I challenged myself to see how many “t-words” I could use in a sentence). Seriously, taxes pretty much affect everything in investing. There are the obvious big rocks, some of which we’ve already discussed, like a 401k and an IRA; using those accounts to defer taxes can save you hundreds of thousands of dollars. Medium-sized rocks like 529s and tax-deductible interest on your mortgage can save you tens of thousands in taxes over a shorter time span. Then there are tons of small rocks which can certainly add up—flex spending accounts and dependent care spending can save you thousands. Add all that up and that’s a lot of clams (if you didn’t read yesterday’s post, I am trying to use as many slang phrases for money as I can). And then you can get into the really obscure Tax optimization strategies. “Loss harvesting” is when you sell investments at a loss so you don’t have to pay taxes on your winners. “Dividend location” looks to put your high-dividend investments in tax deferred accounts like a 401k, so you don’t have to pay taxes on the dividends during your high-income/high-tax rate years. There are millions of these little loopholes and strategies that allow you to pay less taxes. A major part of the accounting industry is based on this fact. Just to illustrate the point, I’ll share a story from Medtronic. If you’re a high-compensation employee (I do not qualify, so I can’t take part in this) you can participate in the Capital Accumulation Program (CAP) which allows you to defer a portion or all of your bonus into a tax-advantaged account—think of it like an extra 401k without the match. This is a veritable tax goldmine, and sadly very few of the people I talk to take advantage of this. Let’s assume Mr Executive makes $300,000 per year, with $100,000 of that being his bonus; and assume that he’s working hard to build his nestegg, so after maxing out his 401k he saves $50,000 in his brokerage account. That’s probably pretty close to the people I’m describing. What Mr Executive could do but probably doesn’t is defer his entire bonus. He’s already saving $50,000 per year and since he’s in a pretty high tax bracket, that’s probably pretty close to what his take-home would be on that $100,000 bonus. However, by deferring his bonus he avoids paying the 40% on taxes now and only pays 5% in taxes when he pulls the money out in retirement. If you do the math, that’s a potential savings of $35,000 ($100,000 x (40% – 5%)) on top of what he’s already saving. When I ask executives why they don’t do CAP they tend to say they never thought of it or they didn’t understand it. When I show them the math says they’re leaving at least $35,000 on the table, their eyes bug out and they need to sit down. That’s just one example of the power of Tax optimization that is out there that goes largely unutilized, even by really successful people, even by those who have tax advisers helping them out. And there are thousands of other examples like that out there. That’s $35,000!!! That’s a lot of money, even if you are pulling in $300k. My point with this and the others is that in the US (and probably every other country) the tax code is super convoluted. Add to that that when you’re making more and more money, you pay more and more in taxes, so the stakes start to get pretty high. That’s a perfect recipe for hidden 1% coupons; some of them are easy to find, some a little hard, and some require serious digging—but they’re there. 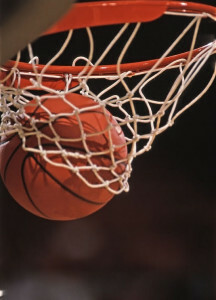 Who goes on to the championship game? Just like in the Elite Eight, I think Tax optimization pulls out a squeaker over Savings rate, 71-68. While Saving rate has unlimited potential, it comes at a real cost of foregoing purchases today. Tax optimization isn’t necessarily unlimited. There are only so many wrinkles and loopholes you can take advantage of, but there are an awful lot of them and I bet you’d run out of time and energy before you’d run out of tax strategies. But what tips the scale is that most of the Tax optimization gambits are free. You’re already going to save for your retirement so why not do it with a 401k and not pay taxes on it right now? You’re already going to save for your kids’ educations so why not use a 529 and not pay taxes on the appreciation? You’re definitely going to need to pay for childcare so why not use a Flex spending account and do it tax free? You and the family are going to get sick so why not use a Flex spending account for that, too? None of those cost any more than you would have paid already, but you’re cutting Uncle Sam out of his 40% (legally, of course). 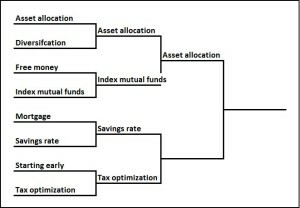 Tomorrow we will see who wins it all, Asset allocation or Tax optimization.